Kenneth E. Hagin was awakened one night in 1987 and prayed in tongues and interpreted for more than four hours. He said the essence of his teaching in Plans, Purposes & Pursuits came from interpreting what he prayed during that time. Kenneth E. Hagin was awakened one night in 1987 and prayed in tongues and interpreted for more than four hours. He said the essence of his teaching in Plans, Purposes & Pursuits came from interpreting what he prayed during that time. 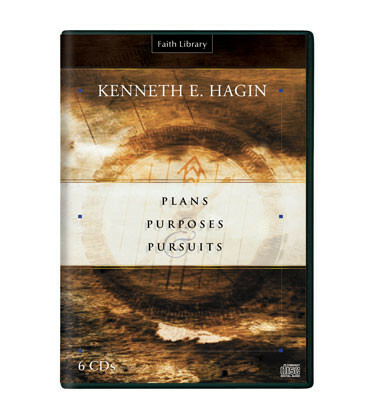 In these messages recorded at Campmeeting 1987, Brother Hagin teaches that the next great spiritual outpouring God wants to bring upon the earth will require that we lay aside our own plans, purposes, and pursuits and seek the true worship of God. In this 6-CD series, he also talks about the ministry gifts listed in Ephesians chapter 4—apostles, prophets, evangelists, pastors, and teachers—and discusses their purpose and anointings.